DETENTION – Exclusive: Special Offer for ticketflap! 4th run of the smash hit physical comedy for all ages! 1. Customers purchased in ticketflap is a ticket voucher. Please arrive the theatre front desk (1/F, Hong Kong Arts Centre) at least 20 mins before the show time in order to exchange for entry tickets. Seats will be arranged at the stall of the theatre (seating plan-http://www.hkac.org.hk/download/eng/Seat_plan_of_Shouson_Theatre.pdf). The organizer will endeavor to arrange connected seats to customers if requested. 2. It is a non-verbal performance suitable for all ages. Approx. 70 mins with no interval. 3. One person per ticket voucher regardless of ages. 4. Ticket voucher sold are not returnable nor exchangeable. 5. Concessionary ticket holders will be admitted only on production of acceptable proof of identity. 6. The management of the venue where the event takes place reserves the right to refuse admission by any late-comers to the event, the management also reserves the right to determine the time at which and the manner in which late-comers are to be admitted. 7. The organizer shall be responsible for making any refund if the event subject to any cancellation or change of show date(s). 8. The organizer reserves the right to add, withdraw or substitute artists and/or vary advertised programmes, seating arrangements and audience capacity. 9. Since it is a special discounted ticket promotion, the organizer will endeavor to arrange connected seats for customers but cannot be guaranteed. Customers are suggested to arrive to the theatre front desk before the show in order to do the tickets exchange and seats arrangement. If any customer who has purchased 10 or more ticket vouchers in single performance, it is recommended to contact the organizer at (852)21445335 for advanced seats arrangement. DETENTION is an original non-verbal physical comedy from Hong Kong and was performed in the U.K., Beijing, Shanghai and other major cities. The show was reviewed by overseas media as a 5-star performance and the show is performed with a group of talented comedians, drummer, tap dancer, xiqu performer & even kung fu master! The story is set around an afterschool detention session; three naughty boys are joined by a gorgeous classmate and ends up turning detention into a talent competition for her affection! Their short-tempered yet ‘extraordinary’ teacher suddenly checks up on them, a series of classroom mayhem scenarios is played out in a comical and exaggerated manner! 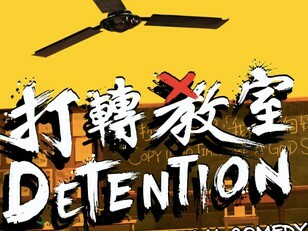 Detention is a fresh example to classic Hong Kong-style humour yet it doesn’t come in words! Tang Shu-wing Theatre Studio is excited to offer special discounts to ‘ticketflap’ fans and good seats are especially arranged! Adult audiences can purchase $260 regular tickets with only $200! And half priced tickets are offered to concessionary audiences! Discounted tickets are limited! Make sure to get a ticket before it’s too late! Note: Customers purchased in ticketflap is a ticket voucher. Please arrive the theatre front desk (1/F, Hong Kong Arts Centre) at least 20 mins before the show time in order to exchange for entry tickets. Seats will be arranged in row G-J (seating plan- http://www.hkac.org.hk/download/eng/Seat_plan_of_Shouson_Theatre.pdf. The organizer will endeavor to arrange connected seats to customers if requested.